Here's another game that we never wanted to look at again, but, alas, it keeps following us. As we have already discussed at great length, Eternal Sonata is a JRPG with a unique concept - it revolves around Polish composer Frédéric François Chopin on his deathbed, dreaming about various music-inspired characters in his last hours. Which is weird, but interesting. However, Eternal Sonata is a deeply flawed game riddled with meaningless and inconsistent plotpoints, shallow characters, and generally terrible writing. It looks very pretty, it has a fun gameplay, but it ended up being a giant disappointment for us. Now, let's review it as part of the Video Game Gender Survey Project, hopefully for the last time. The role of main character in Eternal Sonata is already a mess to talk about. The story revolves around Chopin, who is a playable character in this game, but he is notably not the player avatar. In the beginning of the game, the player avatar is Polka, who is a stand-in for Chopin's deceased young sister, and whose story is otherwise the primary drive of the plot. But after the first hour or two, the point-of-view character is switched to Allegretto, and that's it for the rest of the game, except for one small part where his little brother Beat is the avatar. If Chopin appears as himself, and Polka represents his younger sister, Allegretto means absolutely nothing to Chopin, or to this universe at all. He is just there, adding nothing to the plot and pretending to be the main character. His only function is to have a crush on Polka. Why is he placed in the role of the main character? We suspect the developers thought it was too weird to play as Chopin, and surely you can't play as Polka the whole game, she's a girl, so, Allegretto, whatever. There are indeed more female playable characters than male. However, most of them have the primary feature of their character being that they're paired off with someone. Namely, Claves, Falsetto, and Viola are all in a love polygon with Jazz. Serenade is dating Crescendo, and her conflict over that is the only feature of her character (that, and having a dog). Salsa gets that strange thing with Beat. Polka, as the almost-main-character, gets characterization that's not directly tied to her romantic status, but the game still has to ship her with Allegretto. March is the only female character spared from this shipping nonsense, but then again, she is also spared from having any character at all. In any case, all of the characters of this game are disasters, but we wrote about that already. Once you count the NPCs, it's 36.36% female characters to 41.82% male. This is maybe a little bit better than the usual pitfall of having just one-third of characters be female, depending on if the characters we were unsure on were actually intended to be male or female or neither. The most notable feature of this list is the presence of so many characters with strange names. They are the NPCs of the Score Sessions and so, suitably, they have awful names to match this awful sidequest. This list also features not one but two characters named Bass, just because. Probably the developers forgot they already named a minor character Bass (from the pair of Jazz's friends, Treble and Bass) when they named another minor character Bass (from the pair of Dolce's minions, Guitar and Bass). 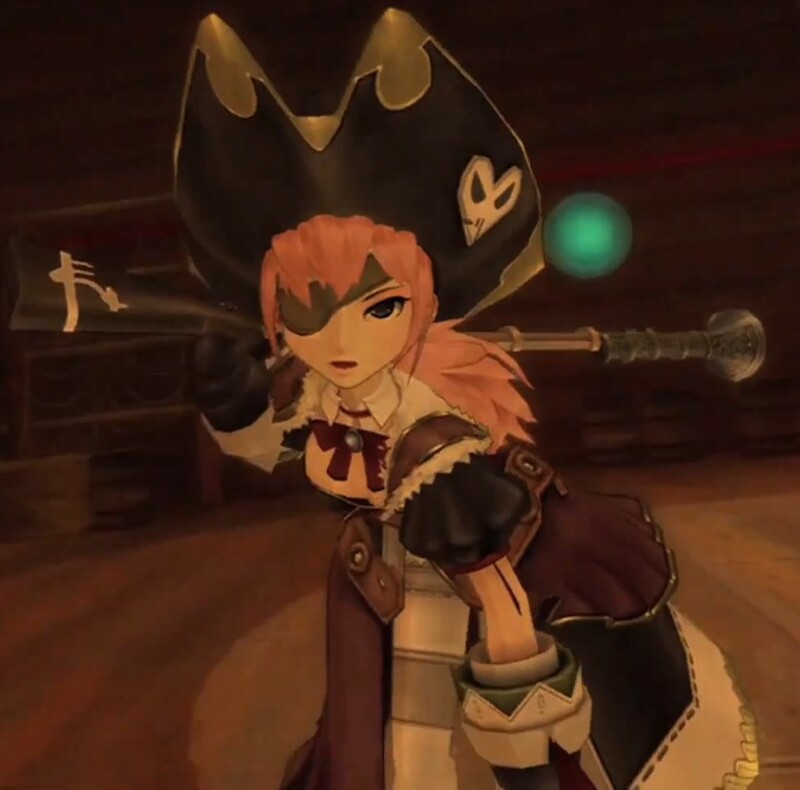 The developers of Eternal Sonata made a point of challenging the stereotype about gender of pirate captains. Well, just because she has an eye patch and a hook doesn’t mean she’s the captain. I thought pirate captains were, you know, supposed to be grizzly old men with scraggly beards. Don’t stereotype! Who says they have to be men? Plenty of women are pirate captains! Female pirate captains exist, but you don't need to take them too seriously because their top concern is wrinkles. Got it. What Salsa says is factually true in real life -- despite stereotypes, there were female pirates and even female pirate captains, although they sometimes needed to disguise themselves as men to trick their superstitious crews. Despite Eternal Sonata drawing attention to this real life fact, and despite Eternal Sonata taking place in a fantastic land that doesn't even need to feel tethered to our world's literal history, it turns out that Captain Dolce is the only female pirate in a ship full of all endless male pirate crew that you face in random encounters. There are no random female pirates on her ship at all. On top of this, if you manage to unlock all the hidden sidequests about Captain Dolce, you find that her story culminates in a cheap joke about her fear of getting wrinkles. Wow. Thanks for that. In the world of Eternal Sonata, gender is shown to be an innate feature of your very soul -- and, in fact, the only feature of your being that is still visible after death. When the party visits Elegy of the Moon, which is essentially purgatory, all the spirits that they meet are either a burning orb of blue energy or a burning orb of red energy: the blue souls were once men and the red souls were once women. It's good to know that, in the universe of Eternal Sonata, even if you get trapped forever in purgatory, at least random strangers will always know at a glance and won't have any confusion with regard to your gender. In case you cannot tell, I am being super sarcastic here. A big problem faced by anyone in real life who doesn't fit super neatly into a gender-conforming box is that random strangers are confused by their gender, can't deal with a moment's uncertainty regarding this trivia, and end up being really rude about it. This unstoppable need to know is so important that the game developers here didn't want the player to be in a moment's agony, so the souls are color-coded, and it is always clear if you are talking with a male ghost or a female ghost. No other aspect of the person's life or personality is visible in their soul. Note also the implications that a male soul is inherently different from a female soul, and that these are the only two types of souls that exist. Why aren't all the souls the same color, showing that, in death, they are all equal? Or, why aren't all the souls completely different colors, showing that they are all unique individuals shaped by their unique lives? Nope, the gender binary. That's all that matters. 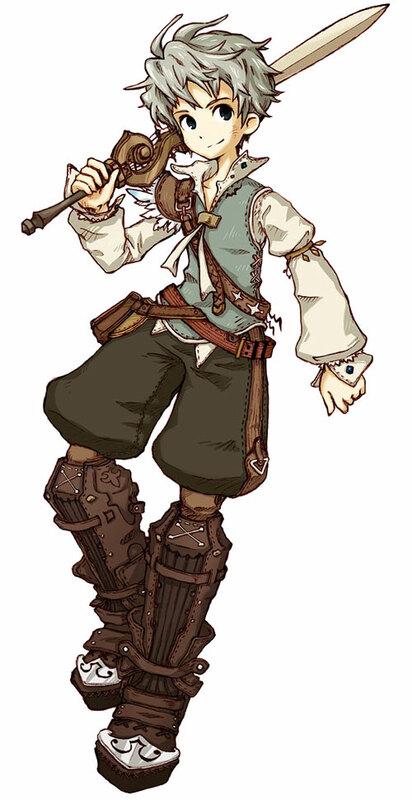 I get the sense that Eternal Sonata was trying to have good gender representation, at least marginally. They managed to have a party of more female playable characters than male characters, even though the game is literally about the real life man Frédéric François Chopin. They even made a point of challenging the stereotype about pirate captains being old men. But then they botched it in other ways. The main character is male seemingly just to avoid having a female main character; the majority of the female party members are only in the story because of their love lives; Captain Dolce is just a jab at the lame joke of women caring too much about their appearances; the gender binary is enshrined in Elegy of the Moon. Honestly, video game developers will need to try a lot harder to overcome their sub-conscious biases and achieve truly equal gender representation in their games. Eternal Sonata/Score Pieces - StrategyWiki, used to make sure we had all the Score Piece NPCs, especially those you can only meet in Encore Mode because, uh, we're not doing that. Women in piracy, a Wikipedia article about female pirates through history.